Eels (the project of Mark Oliver Everett) released a new album, The Deconstruction, today via E Works/PIAS. Previously Everett shared its title track, "The Deconstruction," as well as the upbeat "Today Is the Day." Then there was a video for "Today Is the Day" that starred Mike Mitchell, who plays Randy on the Netflix comedy Love (Everett is also sometimes on that show), as well as two other songs, "Premonition" and "Bone Dry" (which was one of our Songs of the Week). Now "Bone Dry" has a video directed by Sofia Astrom. 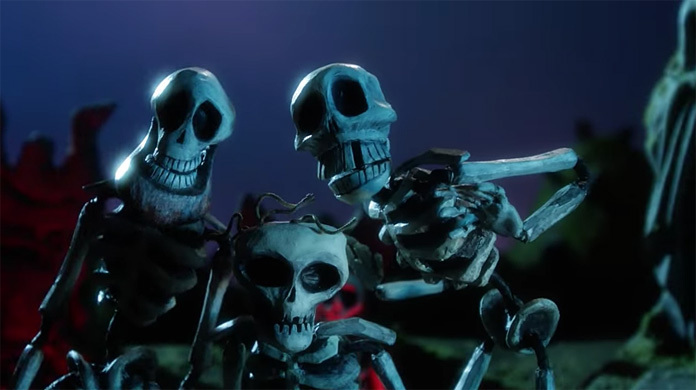 The animated clip has a Tim Burton/Henry Selick vibe and features lots skeletons. Watch it below, followed by Eels' upcoming tour dates. Check back Under the Radar's homepage at 12 PM EST today to read our exclusive interview with Eels. And don't forget if you support Under the Radar on Patreon by April 13 you could enter to win a vinyl copy of Eels' The Deconstruction.